If you suffer from hair loss, you’re not alone. About 50 million men and 30 million women in the United States have hereditary hair loss, according to the American Academy of Dermatology. In this blog, Dr. Joel Schlessinger shares the different types of hair loss and what you can do to treat and prevent it. Some hair loss is permanent while other conditions are temporary, Dr. Joel Schlessinger explains. Permanent hair loss is usually caused by genetics. The most common type of hair loss is male and female pattern baldness, which is characterized by a receding hairline and a thinning crown. 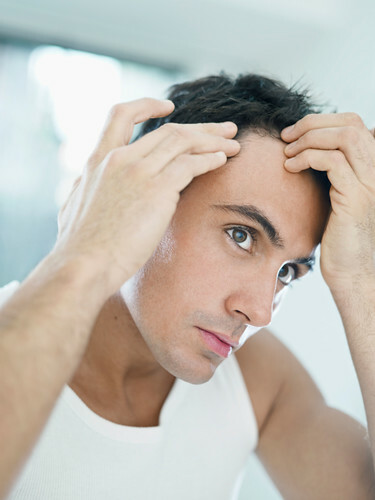 Hormones, stress, illness, childbirth, dieting and some medications are all causes of temporary hair loss. Telogen effluvium is thinning on the scalp, which can be more severe in certain areas. Often caused by childbirth, stress, dieting or medication, this type of hair loss is fully reversible. Alopecia areata is another type of temporary hair loss. This condition occurs when the immune system targets follicles, causing sudden bald patches on the scalp. It’s unclear how or why alopecia areata develops but researchers believe it is an autoimmune disease. Dr. Joel Schlessinger suggests using hair loss treatments to keep your strands healthy. A board-certified dermatologist like Dr. Joel Schlessinger can suggest a personalized treatment regimen to tackle hair loss. If an office visit isn’t an option, there are specialized products that can provide treatment from the comfort of your own home. Rene Furterer FORTICEA Stimulating Shampoo strengthens and restores thinning strands. The unique formula uses essential oils to stimulate microcirculation, encouraging strands to grow stronger, thicker and healthier. Rene Furterer TRIPHASIC VHT Revitalizing Formula for Thin Hair is a unique scalp treatment that promotes stronger, faster and more noticeable growth by targeting the three major causes of hereditary hair loss. Taking care of your strands can also help prevent hair loss. In the shower, gently shampoo your hair and never skip conditioner. Don’t brush your hair while it’s wet as this can cause breakage and damage weak strands. Let your hair air dry, if possible, and always apply a heat protectant spray like Oscar Blandi Pronto Dry Heat Protect Spray before using styling tools. Do you have a question about hair loss treatments? Share with us in the comments. Shampooing and conditioning our hair is something we do so often that we probably don’t give it much thought. However, the right cleansing and conditioning techniques can make all the difference when it comes to achieving your healthiest head of hair. Next time you’re under the stream, incorporate Dr. Joel Schlessinger’s tips to get the most out of your products and routine. Hot showers can cause hair to become dry and damaged, says Dr. Joel Schlessinger. Before wetting your hair, brush or comb it thoroughly. This will remove knots and tangles and make your hair much easier to manage post-shower. Next, massage your scalp with the pads of your fingers to loosen any buildup and debris, making it easier to cleanse away. You may shed 150-200 hairs a day if you shampoo daily. This number could increase if you wash your hair less. Though it may be alarming to see hair in your hand or comb, this isn’t cause for concern. If you suspect that you’re shedding more than normal, consult with your physician. When you’re ready to turn on the water, it’s crucial to make sure that it doesn’t reach an overly hot temperature. “Hot water may feel relaxing, but it can strip the hair of its natural moisture, causing it to become dry, damaged and brittle,” says Dr. Schlessinger. Warm water is optimal for shampooing and conditioning, as it effectively removes oil and buildup without over-drying. Dr. Joel Schlessinger stresses not to judge a shampoo’s quality by how much lather it produces. Thoroughly saturate your hair by standing under the water for two to three minutes. Then, squeeze a quarter-sized amount of shampoo in your palm and begin to gently rub it over your scalp, working up a lather for about a minute. Note that a shampoo’s lathering capability has nothing to do with how well it is working to cleanse your hair. Lather differs between products and has to do with how much foaming agent a formula contains. Dr. Joel Schlessinger recommends conditioning only the bottom half of hair. Rinse away all shampoo suds and gently squeeze the excess water out of your hair. Then apply a quarter-sized amount of conditioner to just the bottom half of your hair, focusing on the ends. Avoid applying conditioner directly on your scalp. The new hair growth at your roots doesn’t need nearly as much moisture as the older, dryer growth at the ends, and applying conditioner to your roots could leave them oily and unbalanced. Leave the conditioner on your hair for two minutes before rinsing completely. Before you step out of the water, seal the cuticle with a blast of cold water. This helps protect hair from damage, minimize frizz and lock in shine. Dr. Joel Schlessinger and other dermatologists can help you determine how often to shampoo and condition your hair. How often you’ll need to shampoo and condition your hair depends largely on your hair type, the condition of your hair and any treatments you’ve had. Though hair is normally shampooed every day, those with naturally dry or brittle hair may find that this strips hair of its natural oils and causes it to become frizzy. Some individuals with straight hair shampoo every other day or three to four times a week, while others with curly or aging hair only wash it every one to two weeks. If you need to go a long time between washes, you may experience a buildup of keratin on the scalp and subsequent itching. Dr. Schlessinger recommends a tar shampoo, like Tarsum Professional Shampoo, to help improve excessive buildup and itching. The medicated gel works to diminish redness, itching, flaking and irritation with a blend of proven ingredients. Hair that has been colored, relaxed or permed is more brittle, so avoid shampooing the day after receiving a styling treatment. Dry shampoo can help absorb oil at the roots to add volume and keep your hair fresh between washes. Klorane Dry Shampoo with Oat Milk is suitable for all hair types. It contains protective ingredients to help clean the hair and soothe the scalp, making it great for balancing oil production and absorbing odors and impurities. Try salon-quality shampoos and conditioners, selected by Dr. Joel Schlessinger, from LovelySkin.com. LovelySkin.com offers a wide variety of shampoos and conditioners for every need and hair type. If you have significant allergies, Dr. Schlessinger recommends Free & Clear Shampoo and Free & Clear Conditioner. The formulas are free of harsh fragrances, preservatives, chemicals and dyes. Cleansing agents remove oil and product buildup from hair while calming ingredients hydrate and minimize breakage. Hair is left clean, balanced and smooth. The TIGI Hair Reborn line uses advanced technology to help restore and revive dry, damaged, frizzy hair of every type. The different products are formulated for multiple levels of damage and help to strengthen hair for the future. One of our bestsellers, TIGI Hair Reborn Sublime Smooth Shampoo, helps to bind down the cuticle so that hair is shinier and easier to manage. The shampoo is color-safe and perfect for all hair types. Rene Furterer hair care features essential oils and plant extracts to naturally enhance your hair. These salon products are formulated to target specific needs and conditions like lifeless hair, flat hair and an oily scalp. Rene Furterer FORTICEA Stimulating Shampoo targets the scalp in order to improve hair strength and promote growth. Microbeads of essential oils help improve microcirculation to restore life to thinning hair. Do you have a question for Dr. Schlessinger about shampooing and conditioning? Let us know in the comments section. Tumescent liposuction is a dermatologist-developed fat removal procedure that is regarded as the safest and most successful method of liposuction. In his latest Slideshare presentation, Dr. Schlessinger answers frequently asked questions about the procedure, including what to expect from your short recovery period and results. The tumescent liposuction procedure allows Dr. Joel Schlessinger and other physicians to remove fat easily. Unlike traditional liposuction, tumescent liposuction is a less invasive procedure that allows for the permanent removal of unwanted fat. During the procedure, large volumes of sterile salt water, local anesthesia and dilute epinephrine are introduced to the area being treated. Once the anesthesia has taken effect, temporary swelling occurs, and Dr. Schlessinger is able to easily remove fat through tiny cannulas no bigger than a sippy straw. Small pockets of fat can be removed from the abdomen, hips, thighs, knees, flanks, chest, chin and neck. The best candidates for tumescent liposuction include those patients who maintain a healthy diet and exercise routine, but who still struggle with stubborn fat in common problem areas. Tumescent liposuction allows for a quick recovery time, says Dr. Joel Schlessinger. After your procedure, you’ll need to rest for a few hours and then gradually increase your activity level as you feel more comfortable. Most patients feel well enough to resume normal activity after one to five days. During your initial recovery period, you’ll need to wear a snug elastic dressing or body stocking over the treated areas. Dr. Schlessinger provides these free of charge to his patients. The most common side effect that patients experience after tumescent liposuction is temporary swelling. Other side effects and complications are extremely rare. Dr. Joel Schlessinger explains what to expect from your tumescent liposuction results. While tumescent liposuction is a permanent fat removal procedure, results vary from person to person. It’s important to be committed to leading a healthy lifestyle once you’ve received the procedure to avoid the risk of gaining back fat. Though weight gain will not necessarily show in the areas previously treated with tumescent liposuction, it will likely be noticeable in surrounding areas. Tumescent liposuction is not designed to remove large volumes of fat and should not be used to jumpstart a weight loss regimen. It is also not approved for removing or reducing the appearance of cellulite. While lose skin following tumescent liposuction is rare, dimples, stretch marks, scarring and cellulite may be accentuated. Dr. Schlessinger stresses that your skin will look the same as it would had you eliminated fat through diet and exercise. It’s important to pick the right physician for your tumescent liposuction procedure, Dr. Joel Schlessinger stresses. Your tumescent liposuction results depend largely on the experience, skillset and qualifications of the physician performing the procedure. Dr. Schlessinger trained extensively with Jeffry Klein, inventor of tumescent liposuction. He has performed over 3000 procedures at his Omaha clinic in the 20 years since he was first trained, making him the leading choice for your Midwest tumescent liposuction procedure. Do you have a question for Dr. Schlessinger about tumescent liposuction? Let us know in the comments section.